​The opening of the Pelham Public Library in September 1995 was the culmination of a 10-year effort on the part of a group of dedicated, civic-minded individuals who came up with a vision for a true town library. They found a former church to house the Library and raised nearly $2 million from the community to purchase, renovate, and equip the facility. 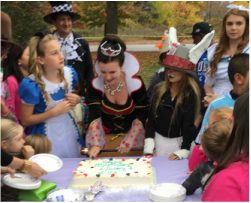 In the fall of 2015, we celebrated the 20th anniversary of the Library--along with the 150th anniversary of Alice's Adventures in Wonderland--during the second Pelham Reads!, a community-wide celebration of stories through literature, art, and film. The Pelham community made the Library happen back in 1995--and still does today. Thanks to your generous donations, we have continued to thrive and grow. Please remember the Town of Pelham Public Library in your giving, and help us to flourish for the next 20 years!